Portrait of Lucy Webb Hayes, February 1875. Wife of Rutherford B. Hayes, she was First Lady from 1877-1881. Lucy Ware Webb was an advocate for the abolition of slavery and the rights of women in nineteenth century America. She was the wife of President Rutherford B. Hayes. Lucy Ware Webb was born on August 28, 1831, in Chillicothe, Ohio. Her father, James Webb, was a physician and strong believer in the importance of education. Lucy attended private schools in Chillicothe, before enrolling in a preparatory academy for women, affiliated with Ohio Wesleyan University, in Delaware, Ohio. She attended this school for six years before enrolling in the Wesleyan Female College near Cincinnati, Ohio. Webb graduated with honors in 1850. In 1852, she married Rutherford B. Hayes. The two had met while Webb was a student in Delaware. At their first meeting, she was fourteen years old, while Hayes was twenty-three. The two stayed in contact, and their relationship developed while Lucy was attending college in Cincinnati. Lucy Hayes would give birth to eight children. Three of the children did not live to adulthood. Before the American Civil War, Lucy Hayes supported the abolition and women's rights movements. Hayes's sister-in-law inspired her to play an active role in both movements. 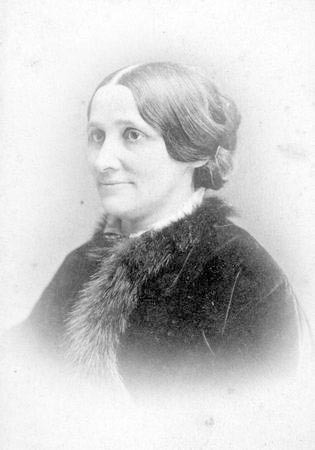 After her sister-in-law's death in 1855, Hayes became less involved in the women's movement, but she remained committed to abolitionism. During the Civil War, Rutherford enlisted in the Union army. Lucy Hayes reportedly disliked being a woman and unable to fight on the battlefield for the North. Her husband served as the commander of the Twenty-third Ohio Volunteer Infantry Regiment. Lucy Hayes routinely visited his camp and assisted in military hospitals. She also secured supplies from Northern civilians to better equip the Union soldiers. Soldiers in the Twenty-third Ohio nicknamed Lucy Hayes "Mother of the Regiment" for her contributions to their welfare. Following the Civil War, voters in Ohio elected Rutherford Hayes governor of the state. He remained in office from 1868 to 1872. Lucy Hayes played an active role in her husband's administration and lobbied the state legislature to provide more funding to schools, orphanages, and insane asylums. In 1876, the Republican Party selected Rutherford Hayes to run as the party's nominee for president. The Presidential election of 1876 was one of the most controversial in the country's history. Hayes was not declared the winner until March 1, 1877, five months after Election Day. In the early days of his administration, the North's military occupation of the South and the Reconstruction era came to an end. Lucy Hayes was a very popular First Lady. Women copied her hairstyle and clothing. She earned the nickname "Lemonade Lucy" because she refused to serve alcohol in the White House. Hayes was a strong supporter of the temperance movement, but it was her husband who prohibited the serving of alcohol. She believed in education and allowed White House servants to take time off from their duties to attend school. Lucy Hayes wanted women to have greater access to education. She believed that women needed to be educated before receiving the right to vote. She also donated up to one thousand dollars per month to assist the homeless. While Lucy Hayes was admired by the American people, she did not enjoy being First Lady. She was thankful when Rutherford Hayes's term of office ended in 1881. Rutherford and Lucy Hayes returned to their home, Spiegel Grove, in Fremont, Ohio, in 1881. Today, Spiegel Grove is operated by the Ohio History Connection and is open to the public. Lucy Hayes remained devoted to her charity work. She played an active role in the Methodist Missionary Society and gave speeches in support of the organization. She died on June 25, 1889, from complications from a stroke. Her husband survived her by four years. Booth, Stephane Elise. Buckeye Women: The History of Ohio's Daughters. Athens: Ohio University Press, 2001.